The words virtual reality can conjure images of futuristic, fantasy worlds beyond belief. But technology progresses, the lines between what is real and what is artificially constructed have been blurred in everyday life. Common examples in movies and magazines leave people questioning imagery and saying, “is that real?” In the transportation engineering world, driving simulators have emerged and developed over the last 20 years as a technology to safely study experimental ideas, limited only to the imagination of the researchers. Arguably, transportation engineers have been able to innovate solutions to the physical challenges: pavement design, drainage, signal timing, hardware, software, etc. However the largest variable in the system remains the human component and driver behavior, which has become more important as new technology adds ease, as well as potential distraction, for drivers. Studying the human aspects is where driving simulation excels due to the flexibility of a controlled environment. As years pass, the technology used in the simulator has become more powerful and researchers have a better understanding on how to leverage the potential of the technology. Using eye movements to evaluate effects of driver age on risk perception in a driving simulator. Potential application of flashing yellow arrow permissive indication in separated left-turn lanes. Safety evaluation of centerline rumble strips: Crash and driver behavior analysis. Use of a driving simulator to evaluate and optimize factors affecting understandability of variable message signs. Using driving simulator to train police officers in the detection of impaired driver behavior. Bring existing road designs to a simulated 3D world to better understand the characteristics of the road contributing to driver misjudgment. Bring proposed road designs to understand user behavior prior to construction. Using a driving simulation approach will allow engineers to proactively evaluate safety while reducing the need for changes in design after construction caused by safety problems which result in additional expenses. 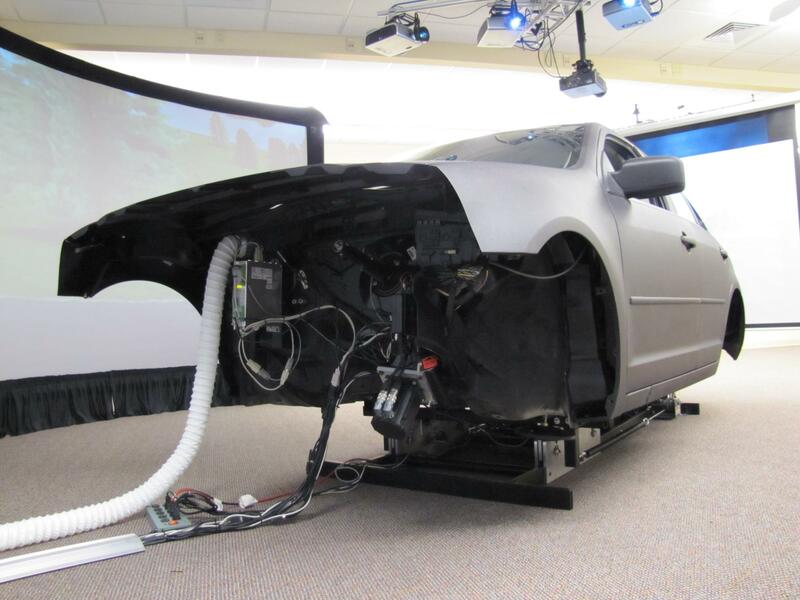 To accomplish these goals, the hardware involved in the full scale driving simulator laboratory is equipped with a full-scale, state-of-the-art, Ford Fusion mounted on a 1-degree of freedom motion platform which provides subjects with the feeling of acceleration and deceleration. 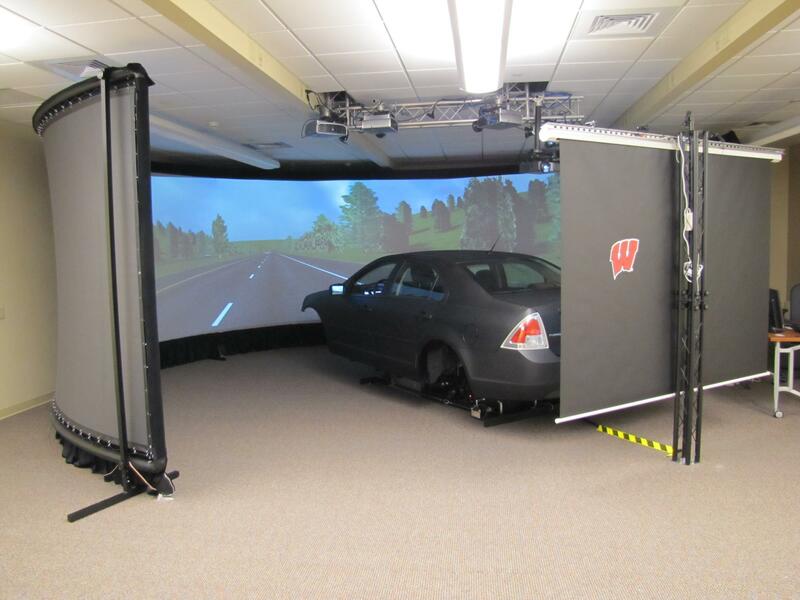 Subjects are exposed to the virtual driving environment through a 240-degree seven feet tall cylindrical shape screen, side mirror screens, and a rear view screen. An array of eight custom-built rack mounted servers are in charge of generating the 3D world and controlling the interaction of the environment with the vehicle at an astonishing 60Hz refresh rate. Driver actions such as steering, acceleration, and deceleration behavior can be also monitored at 60 Hz. On the software side of the system, pre-built scenarios have limited use in site specific studies, and the scenario creation process is a crucial task that needs to be completed prior to conducting any safety evaluation of existing or proposed designs using the simulator. Three tiers of scenario creation are possible. The first tier involves bringing 2D CAD drawings into 3D modeling software such as SketchupTM or Blender for the creation of simulator scenarios. Tier two involves directly importing proposed road and terrain surfaces from 3D CAD drawings into modeling software for the creation of scenarios. A more advanced alternative, described as Tier 3, involves the use of mobile LiDAR data along with photographs to create photo realistic simulation scenarios. The level of realism directly translates to the level of the results: the more realistic the look and feel, the more realistic the driver behavior. Past experience has shown that subject drivers can indeed suspend their disbelief and fall into their natural driving habits, leading to meaningful results that translate into real-world situations. Driving simulation does not come without challenges. Experimental design, scenario creation, subject selection and testing, are time consuming but the results are highly rewarding. Integrating the simulator into the design workflow represents a total paradigm shift from reacting to safety problems after construction to proactively identifying issues before they occur. Learning more about driver behavior will prove invaluable for designing a safer and more efficient transportation system for a future, rapidly changing generation of drivers and intelligent transportation system development. 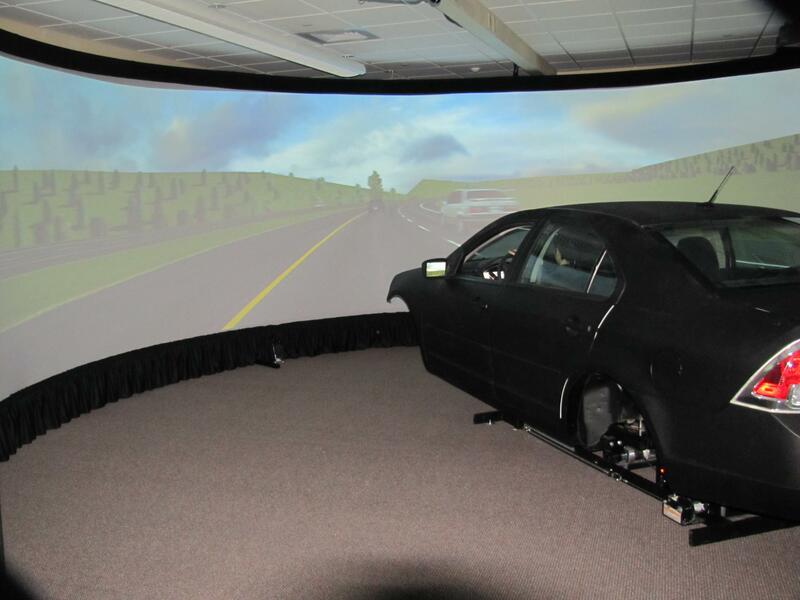 The state-of-the-art simulator at the TOPS lab will ensure that the open road stays open for years to come.